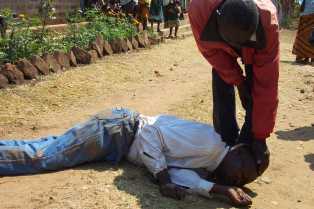 Home / Health / News / Commercial driver suffers epilepsy on wheel, kills pedestrian in kaduna. Commercial driver suffers epilepsy on wheel, kills pedestrian in kaduna. Multiple deaths of passengers and pedestrians in Kaduna city was averted Friday as a commercial driver of an intra-city bus services lost control as a result of epilepsy attack while conveying passengers from the popular Central Market towards Kakuri end of the metropolis. However, an eyewitness account said, the driver killed one of the pedestrians who was identified as a female street beggar. It was gathered that the said epileptic driver lost control from Jos road side of Ahmadu Bello Way onto Gwandu road, about 500 metres apart, with loud noise from the wobbling vehicle. Several passersby were said to have sustained injuries, and were rushed to different hospitals in the metropolis by Good Samaritans. According to an eye witness, Ibrahim Ali "We were sitting in front of this shop, all of a sudden, we saw a bus skidding off Ahmadu Bello Way, from Jos road area to as far to Gwandu road area, before Katsina roundabout. "The driver was foaming at the mouth as soon as he was brought out of the vehicle, and from all indications, he was suffering from epilepsy, and some people rushed him to hospital. "One female beggar by the road side was killed by the driver, and many people were injured, and taken to hospitals," he said. Meanwhile, the Federal Road Safety Commission (FRSC) claimed ignorance of the accident, saying that the Commission did not have record of such accident. Efforts to get the Kaduna State Police Command Spokesman; DSP Abubakar Zubairu to respond on the accident was fruitless as he did not pick his phone as at the time of filing this report.